Has Monday arrived yet again? Hopefully, many of you are already on holiday break and relaxing from the hustle and bustle! :) Good news for this Monday... 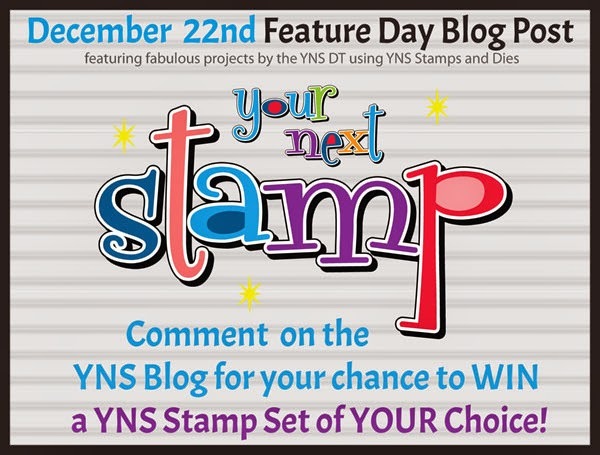 It's YNS Feature Day blog post where you have a chance to win a stamp set of you choice just by commenting on the YNS Blog! How easy is that?! For my feature post, I am using the Holiday Cheers set and some mini bags to create a gift card holder. For the inside, I first measure a piece of cardstock that would fit inside the bag and then measured where the gift card would sit on that cardstock. Using my craft knife, I cut the slits and placed the gift card in to be sure it fit properly. I then used the fun stitched line die to line the edges of the cardstock and stamped the sentiment on top. For the pull tab, I used the banner die from the Seasons Whatnots set and cut it in half so that the fishtail was at the top. Then to complete the look, I used the Gingerbread house die for the gingerbread man and bow to finish it off. I set it to the side and worked on the outside. Using the open scallop die, I cut a piece of patterned paper from Pink Paislee with it for the base layer. I cut out the mug with the Holiday Cheers coordinating dies before stamping the image on top. Copics were used to color in the image. The sentiment was stamped on the banner die cut out from the Seasons Whatnots collection before popping up the image and sentiment, as well as the snowflake from the same collection. The look was completed with a few gumdrops in Pine green and Hollyberry. Thank you for stopping by and I hope you were inspired a little for any last minute gift giving you may have. Don't forget to stop by the YNS blog to leave a comment and have a chance to win!! I wanted to pop in to share with you my Friday Fun Project with Your Next Stamp using the newest release of Clink. This is a versatile set that you an use for the holidays, wedding, or birthday. I made this card for Christmas. This card was made using both the stamp set and coordinated Clink die. I also decided that it would be fun to use the file card die as well for the background sentiment. This die actually coordinates with the fun recipe set. The patterned paper is from Pink Paislee while the image was stamped on Neenah cardstock and colored in with Copics. I added some Wink of Stella to the bubbles and sparkles for the sparkle and popped it up over the file. The sentiment is stamped directly onto the file and the card was completed with some twine and a button. All you can find in the YNS store. Stop by the YNS blog for more inspiration from the DT, as well as the current challenge going on. Thanks so much for stopping in and hope you have a great weekend! I hope you are having a nice week. Did you hop along with YNS with the newest release? Were the projects just fabulous? Not to mention this release had so many fun images and dies as always. Karen always seems to know how to keep us all wanting more every month. Today is the DT Dare and it's Anything Goes! Again, the YNS DT outdid themselves again with the amazing projects. For mine, I used the new release set of Clink! to make this New Year's card. I love the simplicity of black and a metallic color, so I did just that using black and gold. I used the coordinating Clink! die to cut out the image and left it uncolored with the exception of the streamers and bubbles. I colored those in with my Wink of Stella Metallic pen in gold. I then used some gold metallic cardstock to make a tag to be my layer for the image which is popped up. The card was completed with some ribbon, large eyelet, some rhinestones, and the sentiment on the YNS 3D Banner die. Simple and elegant- perfect for the New Year. I can't believe it's the New Year in just a few weeks.... oy! The year went by too fast. Now! 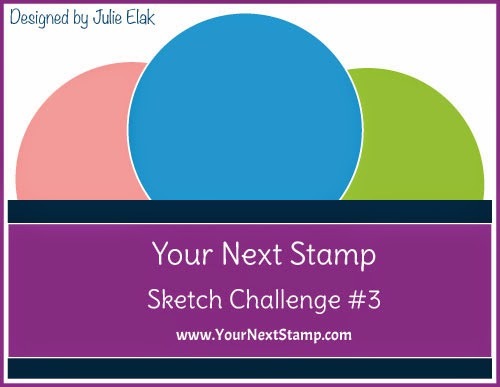 Don't forget to stop by the YNS blog as Karen always pick a lucky commenter to win a stamp set. Who doesn't want that?! Check out the fab projects, be inspired, and create!!! Have a great Thursday! Whoo hoo! It's release time at Your Next Stamp. November's release was such a huge hit thanks to all of you, that I am pretty sure you will love this months too. This release has so many super FUN sets and I will have to say that I cannot pick just one favorite. However, the set of Boom which my projects will feature is certainly in my top 3! This box does lie flat and will fit into a standard A2 envelope. A super fun project to make with this set. For my second project, I couldn't resist using Boom as a tag for some bath bombs. Perfect for teachers or friends who would enjoy these relaxing items. 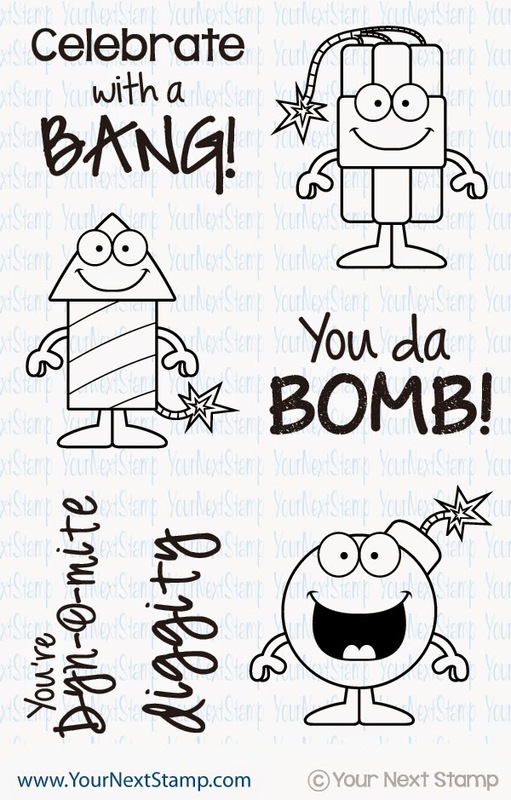 Again, I used the coordinating die and stamped the bomb image over it. I colored it with Copics and made a tag for it to be popped up on. The sentiment background explosion was hand cut and also popped up. I added some ribbon to complete the look and is ready for giving! Don't forget to leave a comments throughout the hop for your chance to win $20 to YNS!! And don't think we've left out an awesome gifty to share with you... Check it out! Come shop for your favorite new releases and save 30%. You can't beat that deal. Now, don't forget to comment along the way and check out the other fabulous projects the DT has in store! 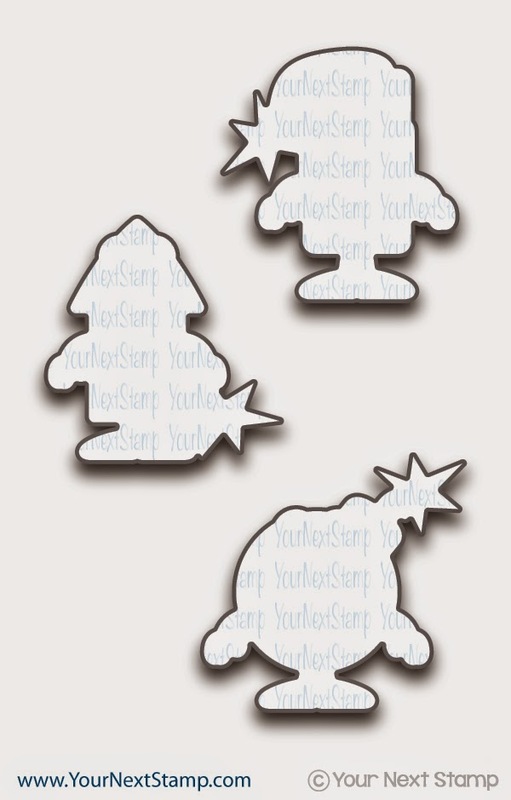 Today begins the fun sneak peeks from the YNS DT for the December release! This release is so much fun with different images to end the year and begin the new year. Not to mention the fun new dies too! For my peek, I am using the adorable new set called Little Darling Aspen. This set is just. too. cute! It is definitely a hard look to photograph on a rainy day like we had here, but I think I got it in. :) Thanks for stopping in and taking a peek! Be sure to stop by the YNS blog to see more peeks from the DT! You won't be disappointed. Have a great Saturday! I hope you all had a good week and now ready for a great weekend. I know I am! This set is a perfect one if you are making recipe cards to give as gifts for the holiday to where you are able to personalize them and make it how you want it. For this card, I used the current sketch over at YNS tweaked just a bit. The patterned paper is an oldie from October Afternoon, that I can't remember the name! For the apron, I cut it out in some scrap SU! Soft Sky cardstock and then cut it again in some scrap yellow to paper piece it together. I completed the look by adding some ric rack ribbon for the sash and some pearls for that girlie touch. :) For the sentiment, I used bits of two sentiments from the set so that it can say, "Life... Just roll with it." Did you notice the fun perforated edge? That's a new fun die called Tiny Stitches and it is just so fun to create with it! Check it out in the store... you won't be disappointed. Especially at the reasonable price! The center scallop circle is from the Open scallop die set. I used a fun pearl flourish for the finishing touch before popping up the card and apron. Thanks so much for stopping in today and be sure to check back here tomorrow- I will have a sneaky peek of one of YNS December release you don't want to miss!! Have a great Friday! Have you checked out this month's sponsor over at Party Time Tuesday? It's Artistic Adventure and her Etsy shop is full of fun vintage style digi tags and images to make your holiday card making a cinch! Here I made a quick gift card using vintage Christmas tags and the image printed beautifully! I cut the image out, matted it against some black and popped it up against some Anna Griffin patterned paper. The tag was finished with some seam binding ribbon, sheer ribbon, pearls, and floral spray to make for this vintage style gift card. We hope you come play along as it is Anything Goes and you get a chance to win some fun stuff from Artistic Adventure! Thanks so much for popping in and have a great Tuesday!